Luna | How Kaycee got her Flow Back. Introducing the newest addition to my hoop Family. . . .
She was a “Christmas” gift and Is my very 1st fancy schmancy hoop. 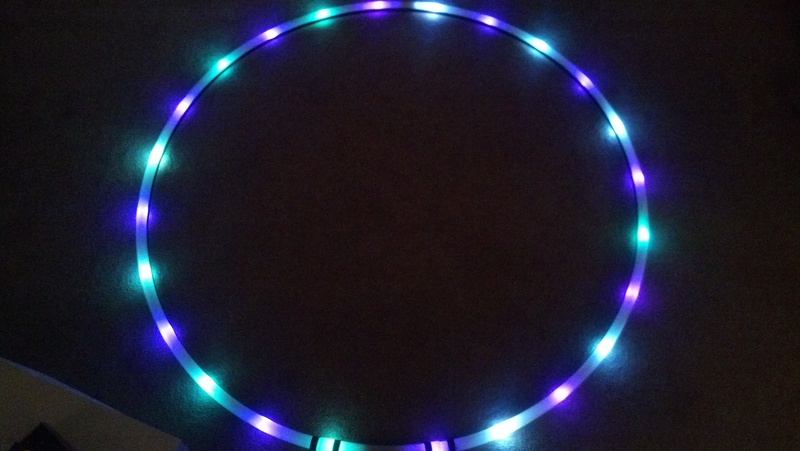 She is a Mood Hoop that consists of Purple strobe lights, and UV green & whites. She is very very purdy. I believe she is about 38″ in diam, with 7/8″ diam tubing. Since I forgot to specify the size I wanted when I asked for her. . . This is what I got. But I am not complaining. I mean, just look. . . how could you complain? And she is purple. If you don’t know. . .Purple is my favorite color. And a fruit. Anyways, she handles very nicely and I can’t wait to really delve in and play. She will be an excellent motivator for me getting back into hoop shape and performing again. I have to say that whilst I was not in the “Christmas” spirit this year (and hardly am I ever these days, as the whole concept of “Christmas, just insults my inner pagan) It was a pretty good holiday.